The lengthy Texas Slat Back Cypress Outdoor Timber Setting lends enough room for family & friends plus plenty of space for all the edibles. Mix the benches up if you prefer – have a couple of backless and the rest with slat backs for a little more back support. Mixing and matching backed and backless benches make outdoor dining sets versatile, eye-catching and a little different. Because the benches are detached, you have the advantage to use them for extra seating elsewhere in your outdoor living space and bring them together when needed. The large Texas High Back Cypress Outdoor Timber Setting lends enough space for family and friends plus plenty of room for all the edibles. The benches solid upper section combined with just the right angle gives excellent back support. An advantage with cross table legs the benches can be stowed when not in use saving on space. A Yamba Slat Back Cypress Outdoor Timber Setting is a practical family size setting. Benches comfortably seat twelve adults and the whole setting doesn’t take up a lot of area when not in use. 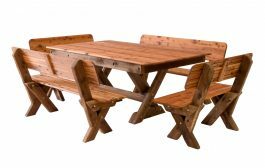 With a solid build in Cypress timber, the 2200mm x 1200mm table with six benches is a hard wearing garden furniture set suitable for outdoor dining and seating area in which to sit back and relax. Mix the benches up if you prefer – have a couple of backless and the rest with slat backs. Mixing and matching backed and backless benches make outdoor dining sets versatile, eye-catching and a little different. Plus as the benches are detached, you have the advantage to use them for extra seating elsewhere in your outdoor living space. 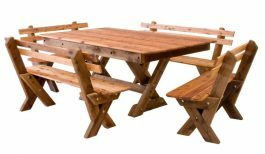 With a build in solid Cypress, the Yamba High Back Cypress Outdoor Timber Setting table L: 2200mm W:1200mm and six benches are a hard wearing garden furniture set suitable for outdoor dining throughout the year. The Yamba High Back Cypress Outdoor Timber Setting is part of our The Solid Timber Man range manufactured from scratch on site at our factory in Queensland. All The Solid Timber Man furniture can be purchased separately or Mix & Match to suit your needs. Predominately we use Australian grown Cypress timber along with other Australian timbers fastened together with heavy duty bolts – unlike cheap imports which use flimsy screws that can’t be tightened and wear holes after time. Why settle for an outdoor timber setting made to suit the majority and not you and your area specifically? Together with a large table and six benches, the Yamba High Back Kwila Outdoor Timber Setting seats 12 people, generally more. The deep rich colour of Kwila used for the settings tops gives a warm and inviting call to be seated. The solid high back benches really do offer a comfortable seating area that subsequently allows guests to sit back and relax at an outdoor gathering. Kwila, also known as Merbau, is one of the worlds most used timbers for outdoors. It has a rich dark red colour in comparison to the paler Cypress wood. Both timbers, finally and most noteworthy, are particularly resistant to termites which many other outdoor timbers regularly are not. Plenty of length – but slender, which makes this Tasman Slat Back Cypress Outdoor Timber Setting ideal for outdoor areas with limited space. Its design is long but narrower than our bigger sets making it a good solution for restricted verandahs or deck areas. If space is an issue, when not in use, the two end benches can be used elsewhere and the four side benches slide almost completely under the table. 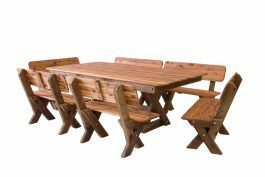 This Tasman High Back Cypress Outdoor Timber Setting is made completely from Cypress timber and as such will have a great amount of longevity, strength and durability – perfect for outdoor furniture! An ideal choice where space is at a premium but high capacity seating is required. Cosy outdoor get togethers around the Currumbin Slat Back Cypress Outdoor Timber Setting can be easily achieved. A very popular and functional addition to any outdoor entertaining area this inviting outdoor set comfortably seats 10 people around a generously sized 1800mm x 1100mm table. Mix the benches up if you prefer – have a couple of backless and the others with slat backs. 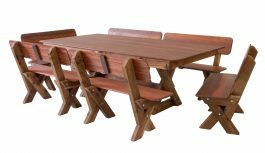 The Currumbin High Back Cypress Outdoor Timber Setting consists of a good sized table L: 1800mm W: 1100mm and high back benches that let the table speak for itself. Benches are a popular seating choice: with simple lines, easy to clean and they enable more guests to be seated around the table than individual chairs.